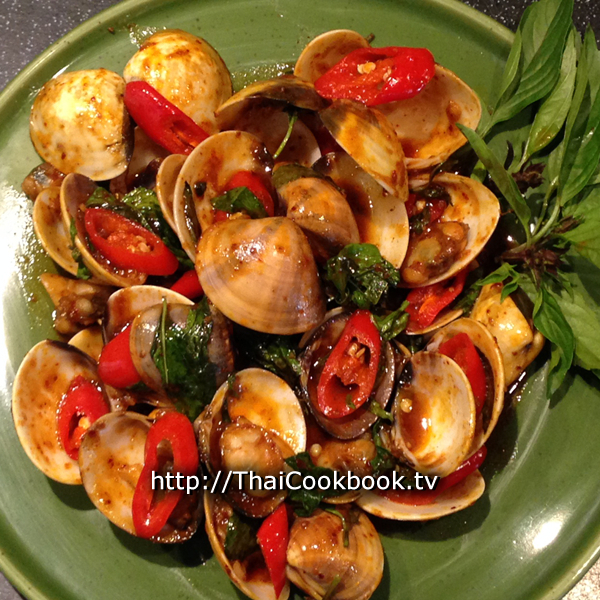 These delicious clams are made even better when they are cooked Thailand-style. The sauce starts with our roasted chili paste, Nam Prik Pao, as a base, so it has a rich combination of flavors. Having been made with fire roasted mild chilies, garlic, shallots, tamarind, and coconut sugar, prik pao tastes both earthy and smokey, while also being sweet and slightly spicy. 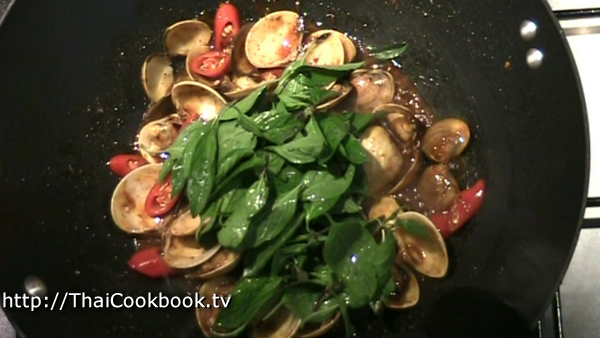 The clams are stir fried in the sauce with some mild red chili and a healthy handful of Star of Siam sweet basil. What's in our Clams in Roasted Chili Sauce. 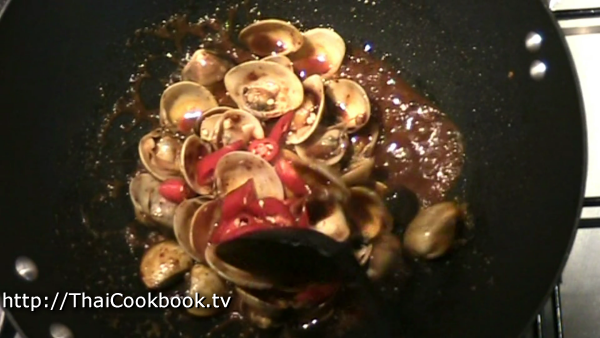 How we make our Clams in Roasted Chili Sauce. 1) In a big wok or frying pan, heat 1 Tablespoon of vegetable oil over medium heat. 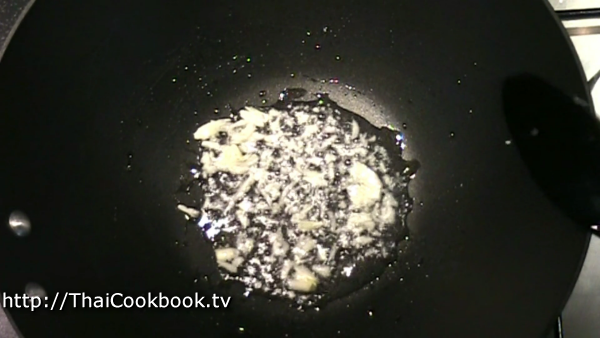 Add the crushed garlic and cook just long enough to start frying a little. 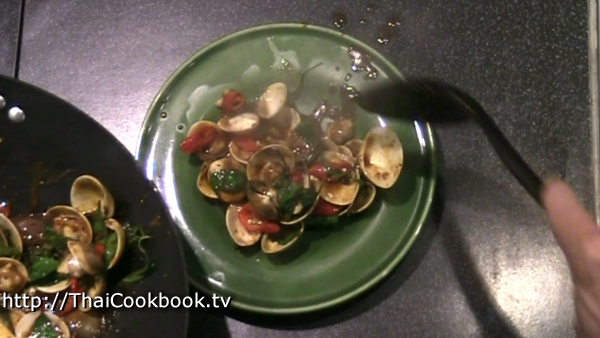 2) Add the clams and stir into the garlic. Cook them, turning over often, until the shells start to pop open, or about 2 - 3 minutes. 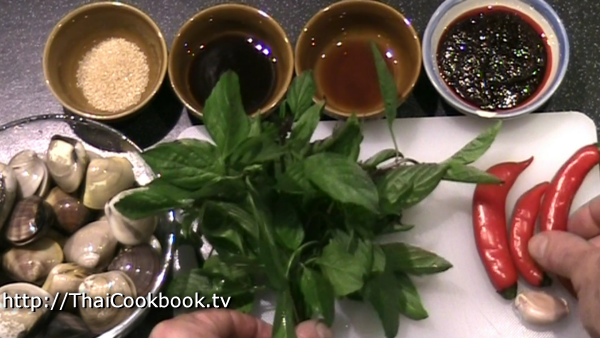 3) Add nam prik pao, soy sauce, oyster sauce, and sugar. Stir in well and let the sugar melt and blend into a nice sticky coating on the clams. 4) Add a small amount of water. Stir well to loosen up the seasonings and make a nice sauce. When the sauce is smooth and bubbling, add sweet red chili. 5) Turn off the heat and add Horapah basil. Toss in well and serve. 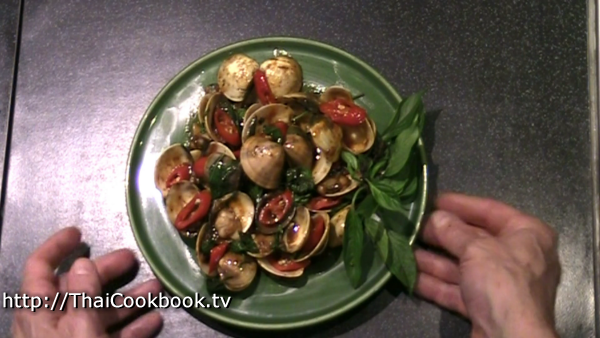 This recipe works well with any type of clam or other similar shellfish. It is excellent with green mussels. 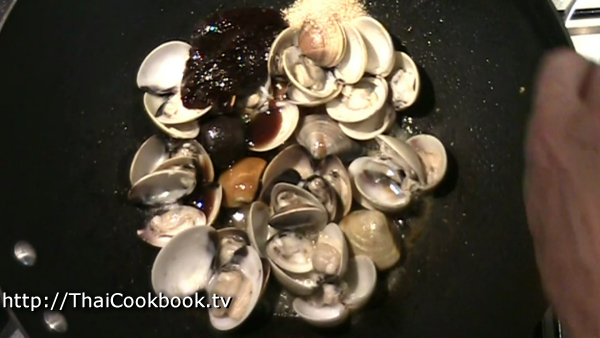 Select a variety of clams, not too big, and scrub the shells well to get rid of anything that might be on there. 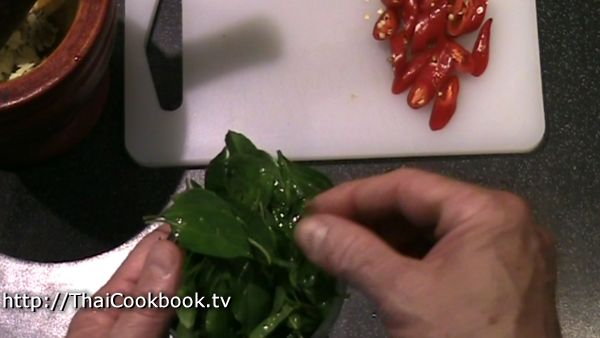 In this type of recipe we always use the basil that wee call Horapah. It's the one that has a distinct smell and taste that's similar to licorice or anise. 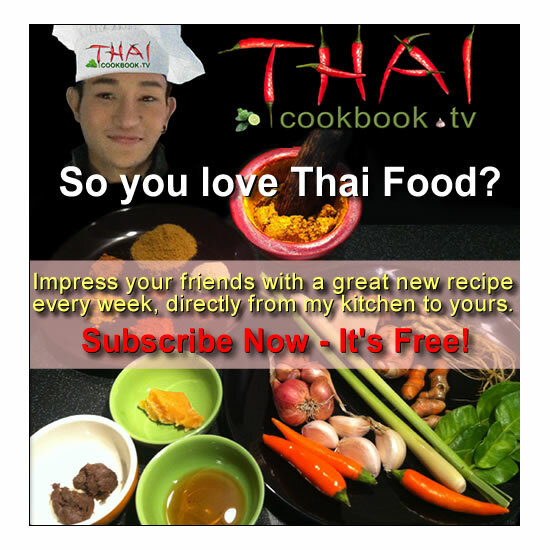 It is sometimes called Star of Siam or Thai Sweet Basil. This flavor is enhanced by the strong chili and spices, where the flavor of other basil like Krapow does not taste good. I'll also use these Thai Long Red Chili. They have a nice flavor and are not spicy. You'll need some Nam Prik Pao, our roasted chili sauce. You can buy it is the Thai food section of Asian markets, or make your own. Here is the recipe. The other ingredients are garlic, light soy sauce, oyster sauce, and sugar. 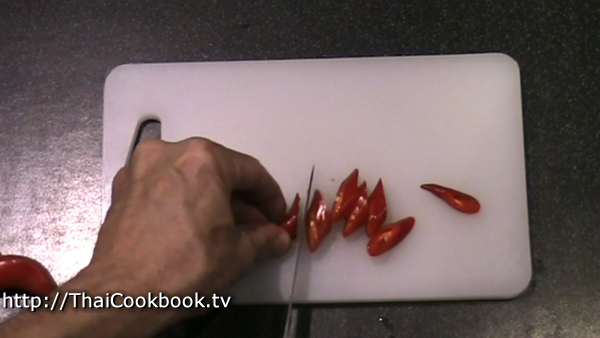 Slice the red chili on a diagonal so it looks nice. 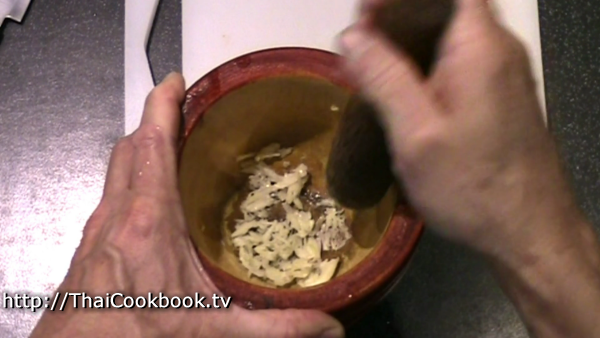 Crush the garlic slightly with a mortar and pestle. Wash the Horapah and pluck the leaves and flower tops, discarding the stems. Note: Some non-stick pans will get scratched by the shells, so use a steel wok or iron skillet, etc., unless you have the very durable type of pan, such as those made new ceramic coatings. So, in a big wok or frying pan, heat 1 Tablespoon of vegetable oil over medium heat. Add the crushed garlic and cook just long enough to start frying a little. Add the clams and stir into the garlic. 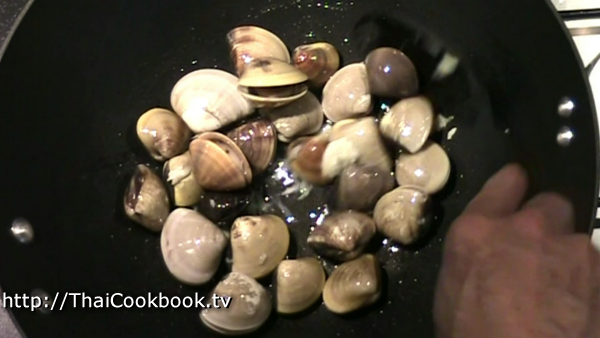 Cook them, turning over often, until the shells start to pop open, or about 2 - 3 minutes. Add the prik pao, soy sauce, oyster sauce, and sugar. 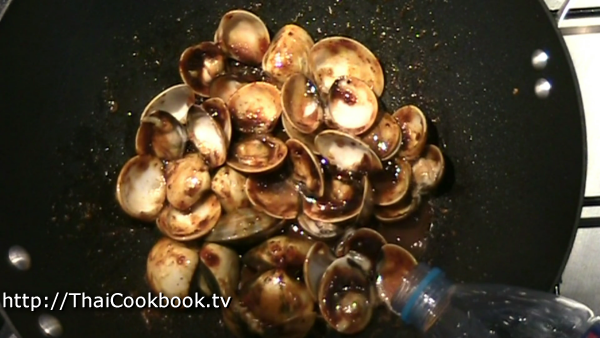 Stir in well and let the sugar melt and blend into a nice sticky coating on the clams. The pan should be getting dry and sticky, so add 2 or 3 tablespoons of water and stir it into the pan to loosen up the flavors and make a nice sauce. Cook until it is hot and bubbly again, or about 1 minute. Add the red chilies and stir in well. Cook for about another minute until everything is hot again. Turn off the heat, then add the Horapah basil and stir in well. It just needs some of the residual heat to get a little wilted. It's doesn't need to be cooked. Serve on a small plate for one person, or to be shared at the table. 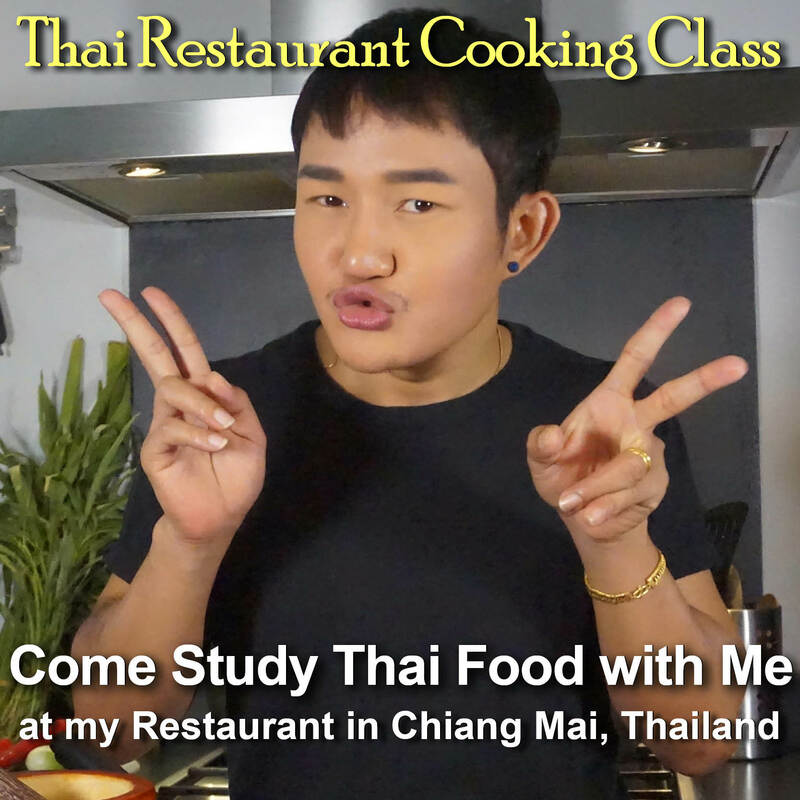 Eat with a generous portion of steamed rice, and other Thai foods. Garnish with some Horapah basil flower tops, if desired.